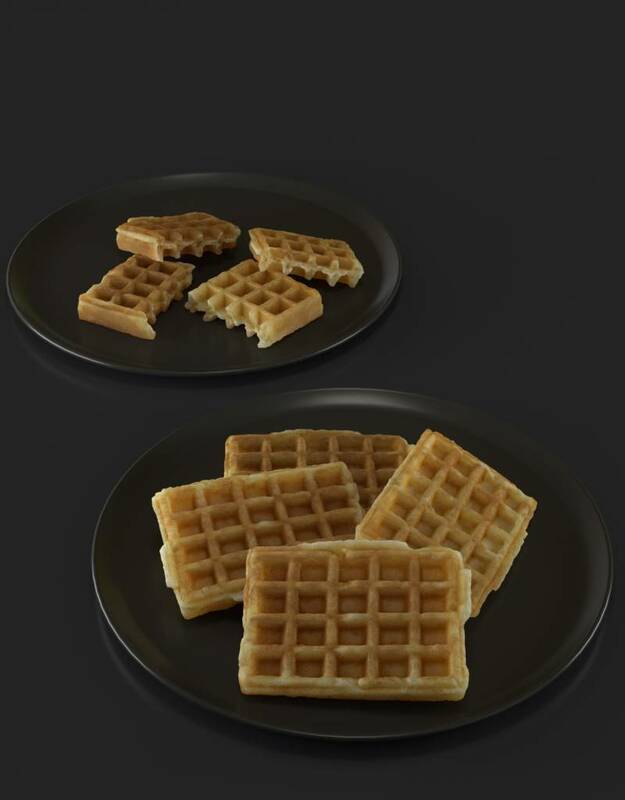 I would like to introduce our newest 3d model of a waffle at CG-Moa.com. I would like to introduce our newest 3d model of a waffle at the bread and pastry section at CG-Moa.com. It is a photorealistic version of a whole waffle on a plate and four halves. Those halves can be combined to two whole waffles. As bonus there's a plate to put them on. So you will receive 6 models for the price of one. Within the Arnold version we achieved the most realistic subsurface scattering possible. So render your own breakfast with our delicious virtual waffles. We also have lifelike photorealistic sugar coated donuts, a rustic rye bread with slices, apple pie, a baguette with halves, sesame seed bagels, croissants, almond custard croissants and Belgian waffles with whipped cream. So start your own digital bakery or organize a nice computer generated brunch with our newest 3d models.